HICKORY — I went to Polly Shook’s Hickory home intending to hear about her many years of service as a hospital volunteer, especially the 50 years and counting that she’s spent assisting in a variety of ways at Catawba Valley Medical Center. Everything changed, however, when Polly opened her front door. Standing next to her was Maddie, a 4-year-old, brindle-coated female greyhound. Naturally, Polly and I had to talk about Maddie. It’s not every day that one runs into someone who owns a greyhound. My first thought was that Maddie might be a rescued former racer. She is. Four days after Polly and Joe married in the 1950s, there was a dog living in their house. Polly discovered that when greyhounds no longer win races – and if no one buys them directly from the track as is a possibility at some racecourses, they are euthanized. The idea of adopting a retired racer lodged in Polly’s mind. When Joe, in his later years, developed a fondness for Polly’s dogs and talked about getting a greyhound, Polly thought maybe the time had come. It did not work out during Joe’s lifetime, though, because there already were dogs in the house, and Joe was dealing with serious health challenges. He died in 2003. The greyhound idea lingered. In 2017, Polly’s only dog at the time, a cairn terrier named Mimi, died. Polly’s daughter, Polly Johnston, “got on the computer and found [Greyhound Friends of North Carolina, Inc.],” said Polly about the Oak Ridge, NC, nonprofit whose mission is to place as many retired racing greyhounds as possible. Polly, her daughter, and her granddaughter, Hannah Johnston, headed for GFNC. Polly was immediately impressed with the facility: “It was cleaner than my house,” she said. Polly did not select a dog that day, but what she saw at GFNC prompted her to return and “look at two particular dogs,” she explained. 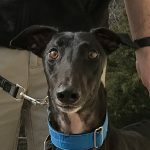 Polly said there is a man who “travels the tracks in Florida,” picking up as many greyhounds, slated to be euthanized, as he can and then leaving them at various East Coast places like GFNC. “He had dropped off two [greyhounds] two weeks before, and one was Maddie,” said Polly. A GFNC manager directed Polly and two dogs to sit outside. Pointing to Maddie, Polly stated, “This one came and put her head in my lap.” Maddie became Polly’s dog in March 2017. “She did fine from the beginning,” said Polly. Maddie wasn’t housebroken, so Polly took her outside every two hours. It wasn’t long before Maddie started going to the door when she needed to go out. Maddie’s not terrified of Polly, though. Wherever Polly goes in the house, Maddie goes with her. Maddie also has grown used to spending time at Paw Tails in Hickory when Polly is going to be away from the house for several hours or when she’s traveling. More greyhound particulars: They have thin skin that tears easily, and they must wear collars made for animals with long necks and long slender faces. Greyhounds are cold-natured and need blankets as well as specially made jackets that will accommodate their large barrel-shaped chests. Not a problem with Maddie, a picky eater. She won’t even gobble crumbs that have dropped onto the floor. Polly warms Maddie’s canned food, which Maddie may or may not choose to eat. “It’s like cooking for the queen,” Polly joked. Of course, greyhounds like to dash around, and can do so at speeds up to 48 mph, but they need only quick bouts of exercise, and then they’re satisfied for hours. Polly said Maddie sleeps 18 hours per day, making her the perfect pet for an older person. A quick romp through Polly’s fenced-in backyard and Maddie’s in need of a nap, preferably on her back with her long, skinny legs sticking up in the air. Polly doesn’t worry about Maddie jumping the fence. Their bodies aren’t built to spring over obstacles. I’ve been thinking about getting a dog after my happy-to-be-an-only-pet cat passes on someday. Since meeting Maddie, I’m beginning to think a trip to GFNC might be in my future. Learn more about Greyhound Friends of North Carolina at greyhoundfriends.com. Share story ideas with Mary at marycanrobert@charter.net. 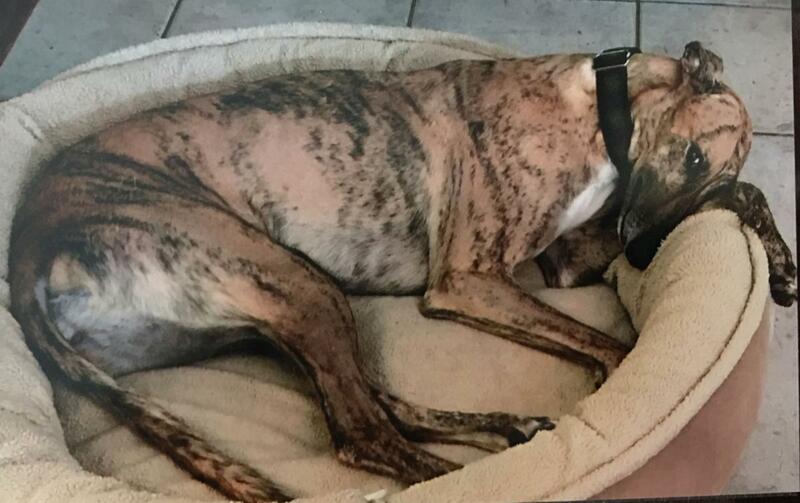 Source: Race For The Heart: Hickory woman has loyal companion in rescued greyhound, retrieved 5/28/2018.